Why is it so hard to get a good internet connection out in the country? I live in a rural area where there is no DSL and no cable. The phone and cable companies will not install the broadband lines in an area where there are not enough people to make it profitable. This is understandable because they might have to put down miles of line to reach just one house. They would never be able to make back the thousands of dollars it costs to lay miles of cable. I say this is understandable, but on the other hand, it's a little bit aggravating because in some cases the internet providing communication companies were given subsidies from the government in order to bring fast web access to rural parts of the country. Instead, they used the money to connect suburban (semi-rural) areas. What does any of this have to do with aircards? Well, aircards are one of the ways a person can get around the issue of no decent phone lines or cable. Anyone that lives within a reasonable distance from a cell phone tower can get internet access with an aircard unless they live in a steep valley or behind a mountain that blocks the line of sight to the tower. Where we live, 6 miles from the nearest DSL or cable, an aircard is the best way to get online. Hopefully, as time goes by, our service provider will have 4G in our area. Then we'll have true high speed internet in a rural area. What does this T-Mobile Aircard offer? * USB aircard connects to your computer to T-Mobile's 3G and Edge network. * Provides unlimited access to wifi at official T-Mobile hotspots using the wifi connection in your laptop. * Memory card (micro SD) slot acts as a thumb drive with up to 8 gigabytes of memory. The T-Mobile webConnect Jet, 3G, Laptop USB Modem, which runs on T-Mobile's 3G wireless broadband network will keep your Apple or PC laptop connected to the internet almost anywhere you. It will even work in a moving car. The webConnect Jet 3G also inclueds unlimited access to at least 10,000 different T-Mobile HotSpots around the world. That means if you are at a T-Mobile hotspot you can use your computers wifi to surf the net and send email for free with no limit on your data uploads and downloads. T-Mobile has a nationwide 3G wireless network that provides broadband for this aircard. This little "modem" plugs into a USB port and works without downloading software, and it has a connector that swivels into the aircard so it won't be damaged when not being used. It also accepts micro SD cards so it can be used as a thumb drive. T-Mobile's aircards come with one of two monthly plans, either a 200 MB per month data plan or a 5 GB monthly data plan. If this aircard is going to be your primary connection to the internet you will probably be better off with the larger plan, but if this is just a back up or something you'll only use while traveling, you can get by with the 200 MB aircard plan. If you go over the limit with either plan, tMobile charges $0.20 per MB. Wifi hotspot usage is free and won't count against your data limit. The webConnect Jet 3G Laptop USB Modem includes a SIM card just like a cell phone. It also includes the software needed to run the aircard on your computer. The software is compatible with Windows and Mac. It automatically installs on your computer when you plug the aircard into your laptop. If you use T-Mobile or you know they have a strong 3G network in your area and you want to buy an aircard to get mobile internet access, this sleek looking little USB modem may be just what you need. If you're like a lot of people who rely on an Aircard to get online, you may be wishing it would allow you to connect multiple computers to the web at one time. Using more than one computer with an Aircard has not been possible, not easily anyway, until recently. That's when the Cradle Point or mobile broadband router came along. If you know someone who has high-speed internet, either through DSL or a cable connection, you may have noticed that they can set up wifi in their house and connect multiple computers or other devices to the internet at once. My brother has this option and he uses a wifi router to allow him and his wife to both surf the net from anywhere in the house at the same time. But this was not an option for people with an aircard until cradlepoints came along. A Cradlepoint is basically a router designed just for aircards . The device is actually called a 3G mobile broadband r outer, and Cradlepoint is a copyrighted name of a company that produces these routers, but most people call all 3G routers by this title. Instead of plugging your aircard into one computer, you plug the aircard into the Cradlepoint, and it creates a wifi signal that allows any wifi enabled computer in the area to connect to the internet through the aircard. Amazing, huh? I live in a rural area, and I never thought I would have a fast internet connection, let alone a wifi network in my home. Aircards made it possible for folks in the country to get a fast internet connection, and now mobile broadband routers are making wifi a reality for people in rural areas. This is also true for people who travel a lot, live in an RV, or need a back up in case other web connections go down. Just like regular wireless routers, the 3G version, a Cradlepoint, has security features to protect your computers and information from snoopers and hackers. It's important to use these features if you don't want other people to have access to your network. Most mobile broadband routers use a firewall or double firewalls to provide protection. They also use virtual private network technology (VPN). There is also at least one benefit of using an aircard and cradlepoint over the use of a traditional wireless router. They are very mobile. You can take these two devices to any place that has cell phone connectivity and a power source (either a battery or electricity) and use them to connect to the web. Like I said before, this is very handy for travelers, and RVers. There are also versions of this technology like Verizon's MiFi that combine a cradlepoint and an aircard into one device. The Mi-Fi is a pocket device that does the same thing as the two devices combined. However, it only allows a few computers or devices to be networked. Other 3G mobile routers allow 10 or more devices to connect, though I imagine they each would have a slow connection, since they would all have to share the Aircard's 3G signal. 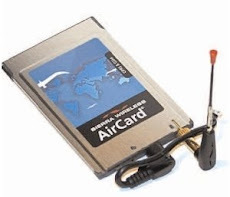 Aircards revolutionized access to the internet for people all over the world. Now, Cradlepoints and other 3G mobile wifi routers are revolutionizing wireless networking for a lot of Aircard users. Aircard is a term for mobile broadband devices. It was probably first used by Sierra, an aircard manufacturer. But the term is certainly not the only one used. Each company that sells mobile broadband seems to have a different word for these gadgets. AT&T calls theirs connect cards. This isn't a bad term. It's short and explains what the card is good for. At my local Alltel store, they advertise them as data cards. That's a bit confusing because some people use that term for cards that store data or software. I've heard people refer to these devices as 3G cards. That makes sense due to the fact that they may use of 3G (third generation) signal technology. Maybe when 3G is replaced by 4G we'll start calling them 4G cards. The term broadband card or mobile broadband card is becoming popular, though some would argue that the cards seldom reach "broadband" speeds. They do offer high speeds, especially when compared to dial-up. Another synonym for aircard is wireless card or 3G wireless. I don't like this one because "wireless card" can also mean a card that connects a computer to a wi-fi system, which is very different than 3G. You may have heard of other terms for aircards. If so, let me know in the comments. Introduction: I was surfing the internet on my aircard this weekend from my parents RV. We were in a campground that didn't offer wifi, so using the aircard from the RV was the best option. I started thinking about how handy aircards must be for people in the RV lifestyle. I started searching a little on the web and found many articles about using aircards while on the road in a camper or RV, but this one by Ms. Bruzenak stood out and luckily I was allowed to reprint it. So, here it goes. This is the only article on Aircard Information that I haven't written, but it has a lot of good info. Check it out. Also, recently, I've helped my brother put together his own blog. It's about breathalyzers and interlock systems. So, check it out if you have time. Most RVers use the Internet to stay in touch with family and friends. Many use it for banking and bill paying. Finding campgrounds, attractions, places to work or volunteer, are all easier if you have a computer and an Internet connection. The methods RVers use to connect are: cell phone modem or Aircard, satellite Internet, RV park Wi-Fi, other Wi-Fi signals, public computers, PocketMail (for e-mail only.) and a dial-up modem connection at an RV park. Three factors will help you determine which form of Internet access is best for you. How often do you connect? For RVers who need a dependable, regular (daily) connection no matter where they travel for business purposes, satellite Internet is a good choice. It works in remote areas when nothing else does. Trees can obstruct the signal, though. RVers who stay along the Interstates and metropolitan areas are more likely to find a good signal from an Aircard, also known as a broadband card. Each cell phone company, though, has areas where their service does not work, especially in more remote areas. Overall, Aircards are getting better, faster and with a signal available in more places. If you only check e-mail occasionally, you might not even want a computer that gets an Internet signal. Checking at public libraries or using PocketMail could work fine. Budget is a factor too. The satellite Internet equipment is a minimum of $1500 for the tripod-mounted dish, $5000+ for a rooftop mount that automatically locates the signal. If you catch a sale and rebate, the Aircard or cellular modem is free. The regular price is as much as $200. The basic monthly service for both Aircard and satellite Internet costs about $60; other plans are more expensive. If you rely strictly on Wi-Fi, cost can be deceptive. You can often find a free signal by driving around, but how much time and fuel are you spending finding it? Some parks and coffee shops charge for Wi-Fi. If you need a subscription for even 24 hours very frequently, you could end up paying a lot per month for service. If you only check e-mail two or three times a week when you have a signal, then you can avoid paying. Consider all that when making a choice. If you like remote areas, you may have difficulty connecting with anything but a satellite Internet dish. If you are usually in more populated areas, check the coverage for the company you are considering for an Aircard or modem; all have holes in their service, not only in remote areas, but in certain states or areas. My sister lives in the L.A. area, north of Pasadena. At her house I have to go outside for my Verizon cell phone to work or stand by certain windows. It works elsewhere in her area. (We couldn't use the Aircard or satellite Internet there either.) If you park in areas with lots of trees frequently, satellite Internet may not work. No one method of connecting to the Internet works all the time. I need to check e-mail and get on the Web nearly every day. We were in Big Bend for several months in 2005-06 and had no cell phone service. My Aircard did not work either. We first got a landline, which got clogged up with users as soon as the kids were home from school. We ended up purchasing a satellite Internet dish, which worked well. The satellite Internet works great - except when it doesn't. In 2007 we traveled with satellite Internet. Even so, we used Wi-Fi in RV parks where we stayed if we were there for only one night rather then set up the dish. We would call ahead to find out. In Maine, we had no signal because of trees; the promised Wi-Fi in the park wasn't operational yet. We used a landline at the family cottage and some days drove about 15 miles to a coffee shop/bookstore for free Wi-Fi. A few times on our travels, I went into the RV park office and used their dial-up or high-speed modems. Several RVers we know have recently given up their satellite Internet dishes in favor of an Aircard. In fact, we too have switched to a newer Verizon Aircard because of problems with speed with Hughes. We know the Aircard won't work 100 percent of the time but are prepared to look for other ways to connect. What we like about the Aircard is that it is tiny and easily finds the signal. We can both use the same Aircard by using a router. With satellite Internet, even though George was quite fast at setting it up, it still took 10-15 minutes, was more involved, and we needed a place to store the dish and tripod. The signal for satellite Internet is more difficult to find than for satellite TV because you have three parameters to match instead of two. The Motostat system that is mounted on your RV roof and finds the signal automatically works well but is much more expensive and you can be limited in where you park so trees don't interfere. With the tripod mount, you can move the dish around. With Motostat, you need to move your RV if you don't get a signal. To come up with the solution that works best for you, weigh all the factors. Choosing either an Aircard or satellite Internet does involve a two-year commitment when you sign up so think it through before committing. And, be prepared to use an alternative method when your main choice doesn't work. Jaimie Hall Bruzenak is an RV Lifestyle Expert. She has been RVing since 1992. She and her late husband weren't retired so RVed on a budget and worked on the road. She is the author of Support Your RV Lifestyle! An Insider's Guide to Working on the Road and other RV books. See http://www.RVLifestyleExperts.com for more information about the RV lifestyle. ©2008. Permission to reprint as long as the full article and bio is included. In a previous post, I wrote about an Acer Aspire netbook that sells for $100 at Radio Shack. It comes with a built in AT&T aircard. Well, that deal has gotten better. Radio Shack is now selling the Acer Aspire for $79. It seems too good to be true, and there is a catch. To get the netbook for that low price, you have to sign up for a monthly contract with AT&T. This contract lasts for two years and costs about $60 per month. For some people who just want a cheap netbook, this is not a good deal. However, if you are in the market for a netbook and want an aircard too, this may be the deal for you. Basically, you will be paying the same price for the monthly data contract as anybody else with an AT&T aircard, and you get a cheap netbook from Acer as an added bonus. I didn't go this route because I don't want a built in aircard. I need to be able to disconnect my aircard and use it with my laptop or my desktop. But, if you want a very small and portable computer that can connect to the internet at high speeds from anywhere with 3G cell service, you might want to check out Radio Shack's offer. Aircard Information. Simple theme. Powered by Blogger.